Wow, the calender says spring, but baby it's cold outside. I know a lot of you are covered up in the cold white stuff. None of that here, but plenty cold. Oh, spring come soon! Lots of inspiration last week and here are just a few. Kristen shared her daughters cute colorful bedroom makeover. She had me at the pink metal bed. I hope you check out the rest at Sophia's Decor. These cute chalkboard planters in the bright spring colors caught my eye. Full tutorial at Tried and True. I shared this cute front porch by Cottage at the Crossroads on facebook last week. 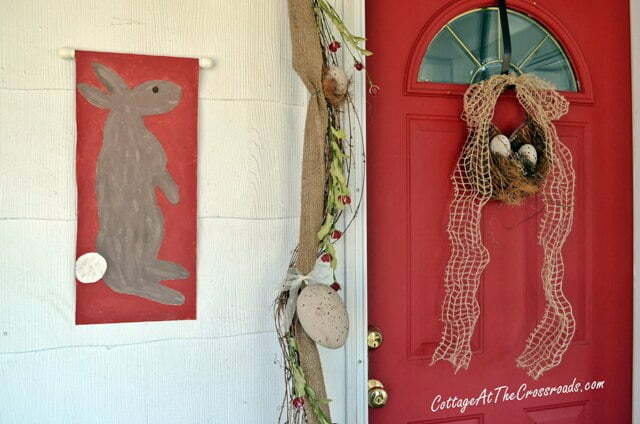 I just love the hand painted old fashioned appeal of the bunnies and done in red instead of the pastels of Easter. 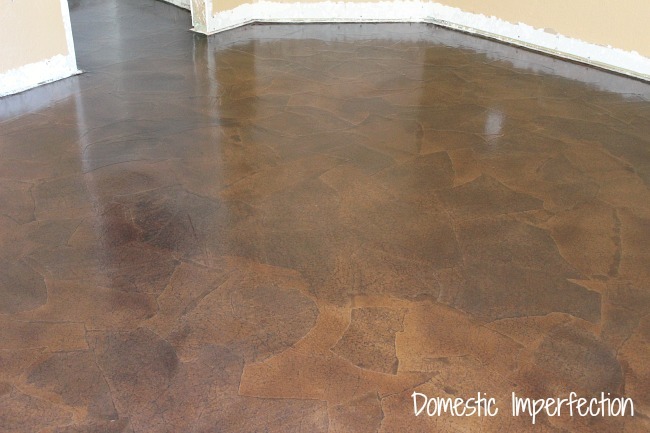 Have y'all seen this floor transformation with brown craft paper. Amazing and a lot of work. Check it out at Domestic Imperfection. 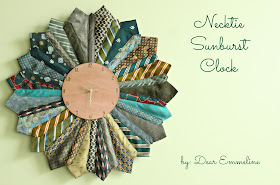 Dear Emmeline shared how to create this cute necktie sunburst clock. Hmmmm, we have plenty of old ties. Love this lazy Susan created by Bliss Ranch. You should see what she started with. Fun and colorful kid's bathroom transformation shared by a new blogger, Eating in the Shower. 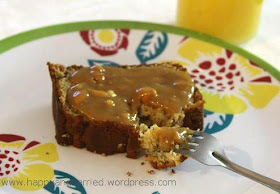 Another new blogger, Happy and Harried, shared a recipe for peanut butter banana bread. Never heard of this before, but I bet it is a lot like a peanut butter and banana sandwich that I eat occasionally. These coconut lemon bars looks so good that were shared by yet another fairly new blogger My Sweet Mission. I love finding new blogs along with our regulars. I hope you will pop in and welcome the new ones. If you were featured I hope you will grab a "featured" button from my sidebar. Thank you so much for hosting Kim. Happy Easter to you and your family. I always wanted one of those vintage beds for Abby's room! Oh well now I will have to wait for grandsies :) Great features Kim. Thanks for hosting us every week! Great features Kim! thanks for hosting. Thanks for hosting Kim! Snowy here for sure! Got to check out the Banana Bread you featured Kim. It looks delicious. Thanks for hosting. It's so cold out! Hopefully next week we'll see warmer temps. Thanks so much for hosting, Kim! Kim ~ I can always count on being inspired at your party ~ thanks for hosting! Thank you for hosting! I love the featured pink and green room! Thank you for hosting, Kim. Hope you have a wonderful Easter. I so enjoyed the many, many beautiful and creative links from last week...so much inspiration, so much talent!...Thanks for hosting Kim. Wonderful features Kim~ love that paper floor! Thanks for hosting! Kim, Thanks for hosting the party! Thanks so much for hosting! Our snow has melted, but just because it got slightly above freezing. Hoping for real spring weather next week. Or by June! Lovely features, thank you for hosting Kim! Happy Easter to you and your family! Love the features Kim! Thanks for hosting! that pink and green bedroom is just adorable! thanks for hosting, Kim!! Thanks so much for hosting! Hope the weather warms up for you for Easter! Thanks for hosting. Happy Easter! 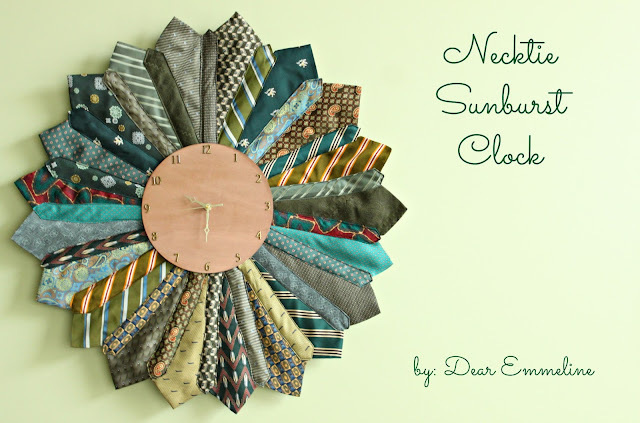 Thank you so much for featuring our spring porch decor! I missed seeing it on FB or I would have thanked you earlier! Now I can admit that the bunnies were the first things that I've hand sketched and painted! Wishing you a wonderful Easter! Thanks for the great party each week. Thanks for the wonderful party Kim! Thanks for hosting the party! It's has been fun seeing your house pop up all over the place on Houzz! Great features!!! That metal bed is gorgeous and love Bliss's lazy susan! Thanks so much for hosting! Enjoy your night. Thank you so much for hosting Kim!! 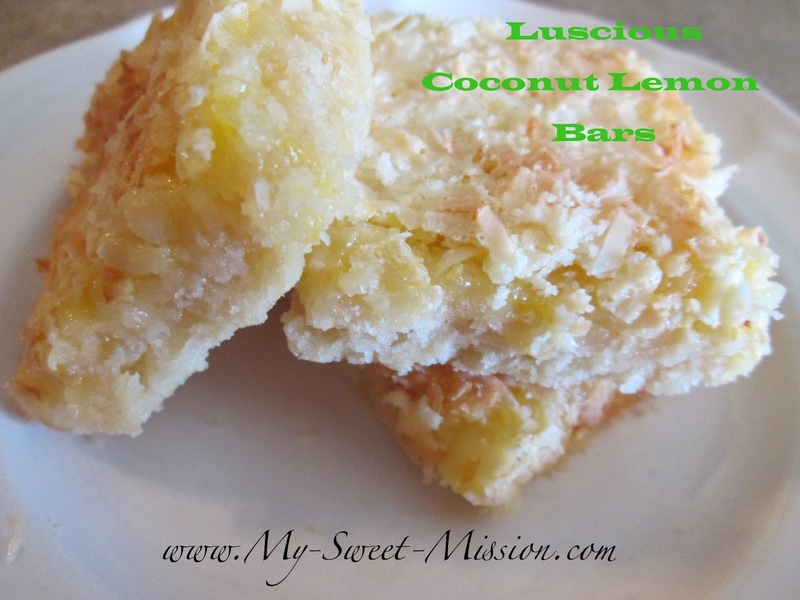 Oh my, those lemon coconut bars look dangerous - and I love Bliss's lazy susan! Thank you so much Kim for hosting! Oh that pink metal bed is adorable! Thanks so much for hosting, Kim. Hope you have a wonderful (and warm) Easter! Thanks so much for featuring my PB banana bread. Super thrilled! And thanks again for the party! oh my gosh so much loveliness all in one post! Great features Kim, and thanks for hosting! There's so much to take in! Thanks for offering us such a fun place to party! Thanks for hosting. Have a joyous Easter. Lovely party again this week! Have a great Easter! Thank you for hosting! Thanks Kim! Love the features this week! Great party! Thanks for hosting!! Have a great Easter weekend! Hi Kim! Thank you so much for featuring my Luscious Coconut Lemon Bars, I really appreciate it! Thank you so much for letting me join in. I see some really interesting/yummy things to check out. J'ai été très impressionnée par le sol avec le papier... Une idée absolument géniale et un résultat concluant. Merci pour l'ensemble de votre publication. Thank you so much for featuring our kids' bathroom makeover and for hosting! Loving all of the inspiration here. Thanks for hosting, Kim! I'm off to check out some of these wonderful features! Great features Kim! I hope to be back next week with something to share. Thanks for hosting, Kim. Have a great Easter. Thanks for hosting the party! Hae a happy Easter! Thanks for hosting Kim. Have a wonderful Easter and a great week ahead. Thank you Kim! Those birdie pots are darling! And that bedroom makeover is gorgeous! Have a wonderful Easter with your family! That pink bed is just darling! Thanks so much for hosting, Kim. Happy Easter! Thank you so much for hosting! Enjoy the rest of your week, and have a Happy Easter! Hi kim, like #43 I too am having trouble linking up to your party 2 weeks in row now. I add the link first before then after but still it tells me I'm not linking back....oh well I will keep trying maybe next week. Thanks so much for hosting, Kim! It makes me feel like a super star to be featured here....really! Thank you. Thank you for the wonderful party! So many amazing ideas. Enjoy your day! all that sugar but did you look at them? Thanks so much for the party Kim! Thanks so much Kim for hosting this lovely link party! What great posts you shared!!! I LOVE that colorful girl's bedroom and that floor looks quite amazing!! I actually tried to do my porch floor like that but it wasn't working so I stopped and did something else. I'll have to see how she actually succeeded with it. :) Thanks for the great place to share!! Thanks Kim for hosting this party. Love the cute girls bedroom and and chalkboard planters. Fun project to do with my 3 girls. Thanks for hosting Kim. Love all the features. Hi Kimmie! Oh, I'm almost late to your party! I had some more puter problems and couldn't link up. But now I can! Wow, Kim. I'm late linking up today and had to scroll down over 300 links. this party keeps growing. What a success! You must be very proud! Ugh ... it's chilly ... no, COLD, up here. Blech! Thanks for hosting ... maybe all of the wonderful Spring linkups I'm seeing will chase Winter away! I'm new to blogging and have just linked up my project. Not sure if I did what I needed. Thank you for the opportunity to share my project. so honored to be featured Kim! thank you!